The hosts have already qualified for the next round, as you would expect from a side with a 4-1 record but this isn’t the case for the team from Novgorod. They are currently sitting with a 2-2 record and they know they need quick wins to push themselves into contention for the rest of the campaign. They have a massive task on their hands and their best hope may be if the hosts have downed tools until the next stage of the Eurocup. 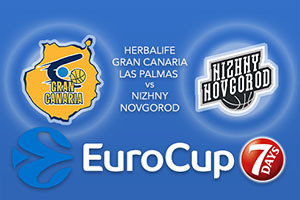 Given that the Spanish side lost last week, they won’t be in a mood to lose two Eurocup games in a row, which may be bad news for Nizhny. The previous game between the two sides this season was played out in Russia and it was the away team that was victorious, coming out on top by 80-106. This is a huge win, so this will give them tremendous confidence that they can bounce back and win again in this game. Gran Canaria are currently ranked as the top scoring team in the tournament, with an average of 96.2 points per game this season. With players like Kyle Kuric, averaging 18 points per game this season and Eulis Baez an average of 11.5 points per game, there is a lot of fire power in this side. No matter what happens this week, Nizhny will not be celebrating qualifying for the next round but they know that if they want to be celebrating that achievement at some point, a win here would go a long way. It is likely to be a difficult task but if DeAndre Kane can stand up and deliver some points, there will be a good chance of success. He has managed to provide an average of 15.3 points per game this season while Ivan Strebkov has provided an average of 15 points per game for the Russian side. This is a game where the Novgorod defence has to be at its best but it is a game where they need to be sharp all over the court. This should be a game where the hosts take control so back Herbalife Gran Canaria Las Palmas at -16.5 which you can find at odds of 1.90. Anyone looking for the Over/Under market should go OVER 171.5 which is provided at odds of 1.90. Bet Now!